Mark your calendar! 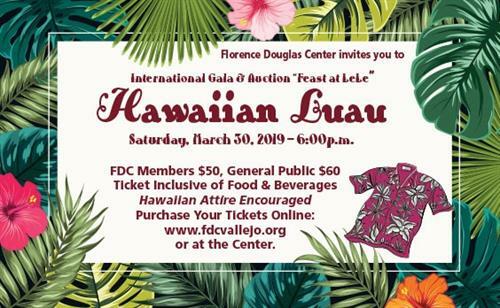 The annual Florence Douglas Center’s International Gala & Auction will be held on Saturday, March 30, 2019. The Center invites and welcomes you to donate an item for auction and attend. This year the theme is “Feast at LeLe”, a Hawaiian Luau. Festivities include cuisine from local restaurants, a full bar, music, raffles, a grand silent auction, and an exciting live auction. The auctions will feature items donated by local supporters exclusively for this event. The goal of the annual gala is to unite the community to raise much-needed funds for the Center’s operations.